Order on-line through PayPal's secure shopping cart, you shouldn't need a PayPal account, you may use your credit card. Email us Let us ship your gifts for you. You may do this directly through the web site, but if you are shipping to multiple addresses sometimes it's just easier emailing us details of what you would like shipped where. Then we can add up your total and send you an invoice via PayPal (which you can pay with your credit card securely). Place your order via the phone with a credit card (515) 451-3413. Most orders are sent via USPS Priority mail; FedEx Home may be used for shipping larger orders, USPS 1st class mail will be used for smaller orders. In stock items are sent within 1-3 business days. Most other orders are sent within 7-10 days or sooner. Items on back order may take longer. MOST INTERNATIONAL ORDERS ARE NOT CURRENTLY BEING ACCEPTING. We still ship to Australia and Canada frequently. Please note shipping to Australia starts at $45.00; Canada starts at $30.00. If you'd like a quote email us at windspinners@msn.com. Duties and Taxes The buyer is responsible for any duties, taxes, etc. that many countries impose on importing products. Please contact your customs for estimates. What do I do with a flat spinner? We do not ship our spinners flat. They are shipped ready to hang with swivel attached. If your spinner becomes flattened from storage; place one hand on top of the spinner and the other hand on the center rings. Then twist the spinner so that the inner rings are 'fanned out'. The rings will move in tandum since they are still attached down the center of the spinner. See illustration below. Oil or replace the swivel if it slows down or squeaks. Our spinners are stainless steel, so there is no need to spray anything on them to prevent rusting. How do I hang my wind spinner? Shepherd's hook, tree hook, deck hook, planter's hook, ceiling hook, etc. You can purchase these items at your local retail store or hardware store that has a garden center. 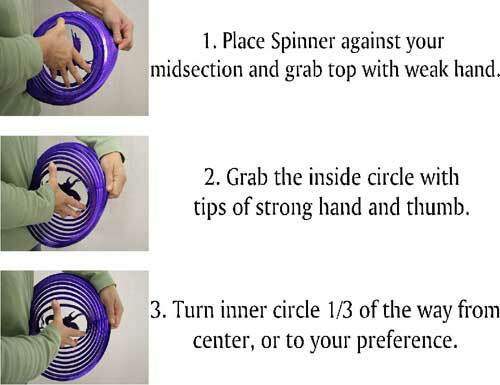 Do you wholesale wind spinners? Sorry we only retail, we do NOT wholesale wind spinners, please no inquiries for wholesale.